If you are not a sewer you might miss the importance of an inspirational life well-lived. Nancy Zieman passed into the arms of Jesus this week. For 30 or more years, I watched her sewing show on PBS all the while improving my sewing skills. She called me to tell me from Wisconsin to encourage me and talk about where to get treatment. We had a great discussion. I sure am, Maam!”She replied. Nancy lived her life with dignity and honor and I am proud to have known her even a little bit. I just read some articles about dementia. Guess what; the sufferers described how their friendships had changed. I had the very same experience when my husband died. People who we’d known for decades, simply disappeared. No cards, no letters no phone calls, no contact at all. The dictionary defines it this way: Friendship is a mutual feeling of trust and affection and the behavior that typify relationships between friends. Friendship is a relationship between people, organizations, or countries that is characterized by mutual assistance, approval, and support. Thankfully, we can have a better kind of friendship. Of course, than we have to be his friend too. And every time I read it, I ask myself these questions. Do I have that kind of obedience in me? Why/ why not? Why do I prolong my personal pain by neglecting God’s words to me? And then I pray something like this. So begins Brenda J. Wood’s poignant account of her “first trimester of widowhood” after the loss of her beloved husband, Ron. The book is written as a series of journal entries, in a conversational style as if Brenda were talking with the reader via email. She writes about whatever’s on her mind that day, from spontaneous tears in public to fear of forgetting Ron to what she’s learning from God on how to cope. As hard as this new life is, she’s determined to push forward into it, even to laugh again. Ron wouldn’t want her to give in to the misery. 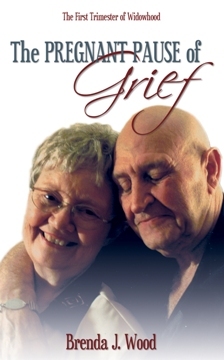 Most of the book is written during the third month ‘AR’ (After Ron’s passing), but the final pages include Ron’s testimony of the difference God made in his life, with brief notes from Brenda taking us past the anniversary of his death. Brenda and Ron weren’t a perfect couple, but they loved each other deeply and for almost 50 years. One of the main take-aways from this book is the call to love our family and friends well, while we have them in our lives. It’s a book that can help those who haven’t lost a spouse to understand the thoughts, emotions and needs of a grieving widow or widower. For example, I didn’t know that finances are often in short supply in the early months until the government, insurances etc catch up on the paperwork. I think it would be a good resource to let newly-grieving readers know what they’re going through is normal. One of the things I found most encouraging was Brenda’s determination to remember how God had looked after them in the past and her choice to believe that even in this new, painful place, God still had the power and the compassion to care for her. Brenda J. Wood is a motivational speaker and writer based in Ontario. She’s also written a book to help children deal with grief, The Big Red Chair. You can read the first chapter of The Pregnant Pause of Grief or learn more about the author on her website, heartfeltdevotionals.com. Christmas is a difficult time for the grieving. Let them grieve in their own way, but let them know you are willing to help them with things like decorating or baking. Take them shopping. Invite them to your holiday functions. Volunteer together at a food bank, collect for a charity or help in a soup kitchen. Do not tell them to ‘get over it.’ Be willing to sit with them when they cry. Let them talk about their loved one. Send cards or letters. Phone or text often. Why? Just because you can represent the loving care of Christ to someone who needs it. Prayer-Father, help us help others through their pain, for so often, you have done the same for us. In Christ, Amen. The second anniversary of Ron’s passing (August 22) and I woke the day after, with these thoughts. “Are you sure?” I ask, brightening a little. I miss my husband so much, but with God’s help, I’ve released him to the larger tub of Heaven because there he’s found the freedom of fulltime living with Christ. Who have you lost? Are you still yearning for them? Will you release them to a larger tub? Prayer- Lord, forgive us for hanging on to what we cannot have. Yours in Christ for larger tubs everywhere….Amen. So the fact that I still struggle in my grief is not wrong, or unusual. The same is true for you. We loved deeply and we still do. Hugs to you all.